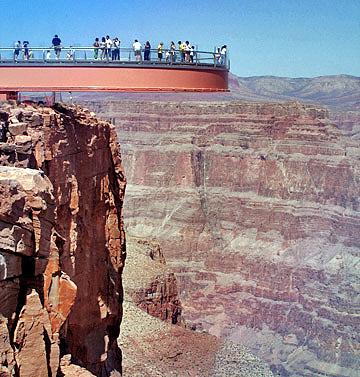 The Grand Canyon Skywalk stretches 70 feet away from the canyon’s rim. The skywalk is capable of holding the weight of seventy one 747 airplanes. It cost over 31 million dollars to build, and was opened in 2004. Souring 4,000 feet above the Colorado River. It offers breathtaking views of the Grand Canyon. It showcases the rugged canyon like nothing else. The U-shaped observation deck appears to be floating on solid air. It is made from 1.2 million pounds of glass and steel. It has no direct support from underneath, but instead it is mounted to the rock using a unique weight system. If you’re curious about visiting, check out this video showing a first-person-view. There is also an excellent video on the National Geographic site. The panels offer a crystal clear view of the canyon below. Each of the glass panels is so strong, they can hold over 800 people at one time! It’s an amazing place to visit, and it’s worth considering if you are planning a visit to The Grand Canyon, but only if you have the extra time and have seen some other sights first. You should know that on Yelp, the skywalk currently has a 2 star rating (out of 5 stars) which isn’t the best. Online reviews can be a mixed bag, but people consistently complain about the experience being less than they expected, and having the feeling that they were being up-sold on everything… you should know up front that it is a tourist trap, and you’ll have to drive over 14 miles just to get there. Not only that, but you’ll discover that you’ll be forbidden from taking cameras out on the skywalk, even after paying $30 for the experience. Yes, they will sell you a photo, but you can’t take your own. I’ve had family members rave about their visit, and so you’ll find some people really love visiting the skywalk. Others, have said it was not worth the time, and cost too much. If you’ve been there, leave a comment and let others know what you thought. I’ve heard countless reports that the pricing as listed is misleading. The web site says $32, but most people end up paying about $80 per person once they factor in a bus ride, and buying the skywalk ticket. Some people report that the dirt road (14 miles) and bus trip (15 minutes) take over an hour, and the worst part is you are charged $45 for the bus ride.